With nothing worthwhile at the cineplex this spring, I’ve been using my Netflix queue to catch up with many of the classics I studied in film class but never watched as a complete whole. 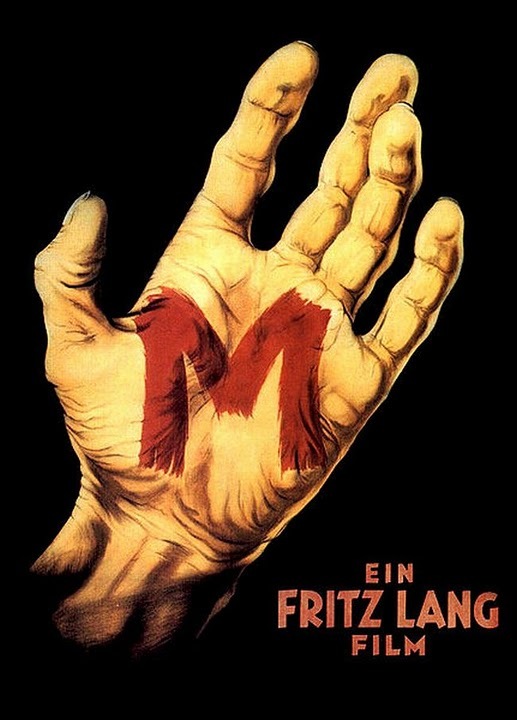 Fritz Lang’s M is one of those classics that looks great on your shelf, but you might only pop in the DVD player for that single scene or shot. I’m not sure I could ever sit through it again fully because it’s so challenging and draining to watch. This is the polar opposite of the film I explored earlier in the month, The Third Man, which I could watch again and again for the entertainment value. That in itself is notable as M is often sited as one of the first films to flirt with noir, while The Third Man is considered by many to be the epitome of the movement. As the film that bridged two significant gaps in film history (the gap between German Expressionism and Film Noir, and the gap between silent films and talkies), M also exists above the scrutiny of a modern film critic. I decided to tackle it as I would have when I was a psychology major in college. The film is endlessly fascinating in its symbolic imagery and psychological, sociological, and political underpinnings. 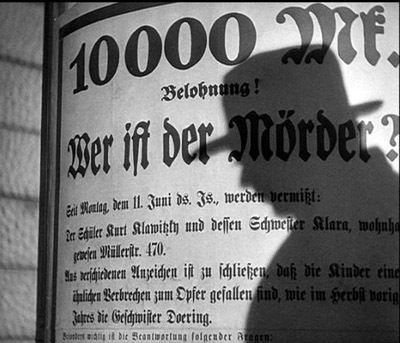 In an eerie propagandist fashion, the phrase “in the name of the Law” is repeated over the last two scenes of Fritz Lang’s M as a child killer is brought to justice. If “L” represents the State and the Law, then “M” is meant to represent the Individual (who in this case is a Murderer). Lang boldly asked us way back in 1931, whose rights come first: the State or the Individual? A master of his craft, Lang leaves the question open-ended and let’s the audience decide. M is shockingly contemporary in its psychological complexities. It explores the psychology of individualism vs. group think while showcasing how a state of fear can be inflicted upon a populace when a government fails to protect society from a single individual terrorizing the people. The story is fairly straightforward: An elusive citizen begins killing innocent children in a large nameless German city. The media fuels a paranoid frenzy that incites the public. The clueless police begin to raid “the underworld” after the populace is turned into a raving mob because of the failure to capture the killer. “The underworld” comes to a screeching halt as their business is ruined by the police and starts their own manhunt for the killer. Unlike a modern period piece that attempts to evoke a certain place and time, M WAS a certain place and time. Lang, in an almost prophetic sense, captured the state of mind of the German people in 1931 as the Weimar Republic was on the brink of collapse and the Nazi Regime was preparing to take over. When individuals live in a state of fear, as they do in M, society collapses and the Individual is crushed. Only the State, it seems, can bring order. M is a also a masterpiece for its technical aspects. The way in which Lang uses his camera to move through windows, capture shadows, reflections, empty spaces, and shift points-of-view is staggering even by today’s standards. He also played with the new technology of recorded sound with extensive voice-over narration and dialogue used to overlap and transition between scenes. Didn’t critics recently praise Michael Clayton for utilizing just such a technique as if it was something revolutionary? One can also see a protean style the would eventually birth the Film Noir movement with the creation of tension and suspense in the use of shadows and camera angles. Yet M is not perfect. It has some major flaws. There are no real “characters” in the film to speak of in the modern sense. The film is virtually all built around mood and plot. The only time Lang invites us to emotionally connect is in the opening and closing scenes with a mother of one of the victims, and in the classic scene of Peter Lorre giving his writhing and primal “I can’t help it!” speech in front of the kangaroo court of criminals. The mother’s grief and Lorre’s madness are presented so sparsely and in such a raw form that it becomes too painful to want to connect with them. Another flaw that is often overstated about films from this time period is the slow pace of the early police procedural scenes. These inherent flaws combined with the inherent brilliance of Lang’s vision make M one of the most challenging films a modern viewer could ever sit through. What impressed me most about M was the subtlety of the symbolism Lang created with his haunting images. As harrowing as the story is, none of the gruesomeness is shown on screen. It’s all transmitted to the viewer through the power of suggestion. Is it any wonder Hitler wanted Fritz Lang for his propaganda machine, which thankfully led to Lang fleeing to America? I’ll never forget the wide shots of the kangaroo court (and the looks on those people’s faces as the killer is brought down the steps for trial) or the vast expanse of that empty warehouse. The scene of the ball rolling in the grass with no one to catch it, the balloon caught in the telephone wires, and the empty domestic spaces the mother has to inhabit after her child has been murdered are the types of scenes that tape into Jungian archetypes and shared fears. The look on Lorre’s face as he confesses, the hand of the Law coming down to save Lorre from being lynched, and the ghastly plea from the mother in the final scene will stick with me for the rest of my life. M is a communal nightmare; one that from which we have yet to awake. This entry was posted in Art, Art-house Cinema, History, Movie Reviews, Movies, Politics, Psychology and tagged Film Classics, Film Noir, Film School, Fritz Lang, German Expressionism, Group Think, Individualism, Jungian Archetypes, M, Nazi Germany, Peter Lorre, Propoganda, Symbolism, Weimar Republic. ← For the Love of Pete! Nice piece. But I can think of plenty more challenging films for modern viewers — silent drama sets up obstacles that even a very early sound film like M doesn’t have to face. Lang’s NIBELUNGEN saga is more inhuman, slower, and stranger. I agree that the film neglects characterisation, but don’t see this as a function of its age. Most early 30s film focus on character to a far higher degree. But M is a police procedural without a protagonist — comparable to THE BOSTON STRANGLER — the only protagonist is society. The avoidance of in-depth characterisation is a deliberate strategy! It might or might not work, but it can’t be dismissed as a flaw in the execution. Very perceptive and thanks for bringing some scenes I have had forgotten. It reminds me of a chilling and dramatic scene where the child, the victim points out to the murderer the curious chalk mark on his shoulder. Realization dawns on the murderer that Law has almost laid hand on him. Ironically it is the hand of the underworld. Hey, I can read that poster! Just pokin’ my nose in to say hi, Dave. Well, I don’t agree that the police are clueless. They blunder at first, but then catch on. They do find him at the end, not long after the crooks do. The images of their pre-digital investigative machinery are fascinating to me. The several shots of maps, one that shows a map with a bit of the real world sitting in the middle, the combing through the databases of the day, paper, and the use of deduction to finger the killer. It’s a great film, and I don’t know why you are so concerne with whether or not contemporary audiences are willing to sit through it. Consuming culture from another period is always a minority taste.